Happy holidays and New Year to all of our trusted clients, partners, and friends! As 2018 comes to an end, we wanted to take a moment to reflect and celebrate. It’s not every day that we get to pause our busy lives and recognize our accomplishments together! 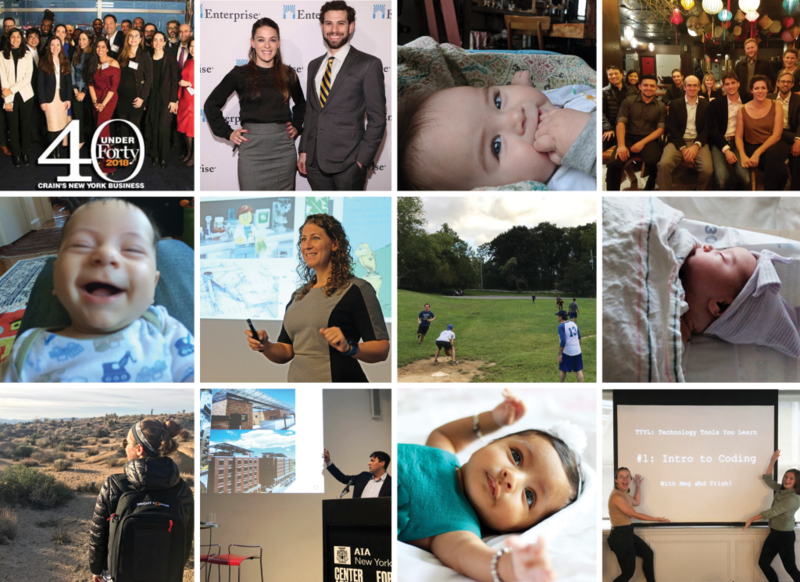 We are proud of every one of our projects but want to highlight some from the past year. 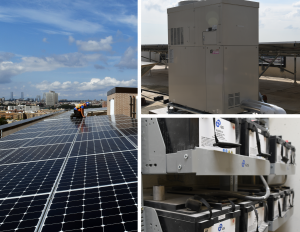 RDC Development (MDG Design + Construction, LLC and Wavecrest Management) installed a 575 kW system across 20 buildings at Ocean Bay Apartments. Bowery Residents’ Committee (BRC) installed a 114 kW trellis pergola system at Apartments at Landing Road to ensure long-term affordability for the low-income housing complex. Postgraduate Center for Mental Health installed a 70 kW trellis pergola system at Marion Avenue Apartments and a 66 kW ballasted and flush-mounted system 500 Gates Avenue Apartments. The Bridge installed a 33 kW trellis pergola system at Maple Street Residence. And, Acacia Network installed a 106 kW post and rail solar PV system at Acacia Gardens. 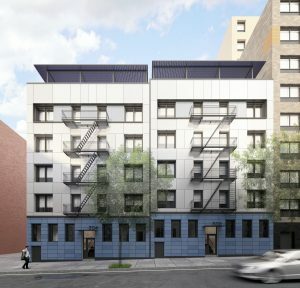 Delancey Street Associates (L+M Development Partners, BFC Partners, Taconic Investment Partners) installed a 31 kW post and rail array at The Goldin at Essex Crossing. We installed community solar on The Grinnell’s rooftop. 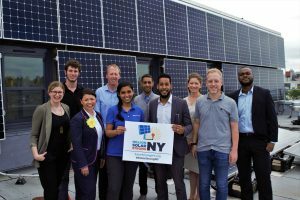 And, Bright Power is bringing a total of 4 MW of community solar to more than 100 New York City Housing Authority (NYCHA) buildings in the five boroughs. Architects’ are using vertical solar to enhance the design of their buildings. Examples include Magnusson Architecture and Planning PC for the Association for New York Catholic Homes’ St. Augustine and Curtis + Ginsberg for Dunn Development Corp.’s The Meekerman. Many of our clients are integrating resiliency strategies into retrofits or new developments to provide power security in addition to ongoing savings. 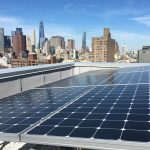 Community Access’ new development in the Bronx will have a Bright Power Resilient Power Hub, which combines solar PV, battery storage, and cogeneration, as will Omni New York, LLC’s Archer Green in Queens. 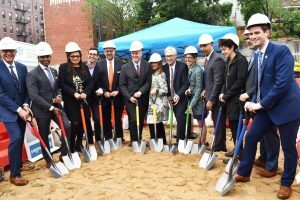 HELP USA / SAGE and BFC Partners / SAGE each broke ground on the first senior living environments that promote diversity and safety for LGBT elders in the Bronx (Crotona Senior Residences) and Brooklyn (Ingersoll Senior Residences). BRP Companies and Hudson Companies broke ground on La Central. The Jericho Project and B&B Urban opened Walton House, the first supportive housing development to open under Mayor Bill de Blasio’s NYC 15/15 Initiative. New developments that completed construction include Monadnock Construction’s 530 Exterior Street and 491 Gerard Avenue, B&B Urban’s 294 East 162nd Street, RiseBoro’s Our Lady of Lourdes, and Jonathan Rose Companies’ The Caesura. Passive House and net-zero projects are growing across NYC. Bright Power has 16 active Passive House, net-zero, or near net-zero new development projects underway, including RiseBoro’s Harry T. Nance Apartments and Woodlawn Senior Living, Phipps Houses and Acacia Network’s 1675 Westchester, and Omni New York’s Morris II Apartments. We’re proud to be one of the solution-provider teams designing high-performance retrofit solutions as part of the New York State Energy Research and Development Authority’s (NYSERDA) RetrofitNY program. Manhattan School of Music celebrated its 100th Anniversary with improvements across campus, including a new HVAC system and better temperature/humidity control (which is key to keeping all those pianos in tune!). Marymount Manhattan College committed to sustainability by partnering with Bright Power this year to reduce their campus’ carbon footprint. Both schools are working toward utilizing real-time energy management to help reduce operating costs, as well as develop long-term energy and capital improvement plans. With Affordable Community Energy Services (ACE), we started phase two of the Mercy Housing California retrofit project, upgrading over 80 properties. Energy Upgrade California Multifamily congratulated MG Properties Group’s Stonewood Gardens for taking advantage of their incentive program. 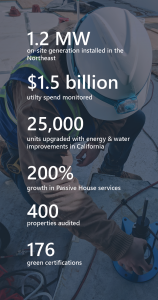 Jonathan Rose Companies’ Casa Panorama is utilizing the LIWP program to install comprehensive upgrades and solar PV at the Southern California property. 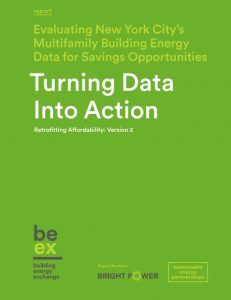 We also partnered with Building Energy Exchange and Sustainable Energy Partnerships to release the Turning Data Into Action report that gives owners access to tearsheets containing energy upgrade opportunities matched to key points in a building’s financial life-cycle. Community Preservation Corporation (CPC) and Bright Power launched CPC VeriFi, a new tool that leverages data collected from our EnergyScoreCards platform to calculate customized opportunities for building owners and developers to cut costs using energy and water upgrades. Fannie Mae selected Bright Power to provide energy and water measurement and verification for Fannie Mae’s Multifamily Green Financing programs. We will provide services to Borrowers and Lenders to make it easy for them to gather, analyze, and report on energy and water usage and savings. Congratulations to all of our employees on their professional and personal accomplishments this year! Bright Power was again listed as an Inc. 5000 fastest growing company, making 2018 the third year we have received this honor. We also were spotlighted as a fastest growing energy company by Business View Magazine. Our President & Founder, Jeffrey Perlman, was included in Crain’s NY 40 Under 40. Director of New Construction, Andrea Mancino, and Project Manager for On-Site Generation, Husna Anwar, were both included in NYREJ’s 2018 Women in Real Estate & Construction Services. Andrea also shared the benefits of commissioning in a two-part series article in NYREJ. Vice President of Energy Markets, Dan Levin, received an NYECC Energy New York Award (ENYA) for Leadership based on his role as a founding member of NYECC, board member, and Co-President for over 7 years. Technical Director, Michael Brusic received a Service Award from Urban Green Council recognizing his work on the “It’s Electrifying” event series that helped illuminate how electrifying building systems will help NYC meet its 80×50 goal. Account Manager, Jamie Bemis, received the prestigious McCloy Fellowship to study housing and urban development in Germany this spring. She presented her findings to a small group of partners, clients, and the Bright Power team to share what she learned. You can read more about her studies here. Account Manager, Sam Biele-Fisher, served on the programming committee for the BuildingEnergy NYC 2018 conference, where he both curated and moderated the Net Zero Retrofit Solutions for New York’s Multifamily Buildings: RetrofitNY panel. Cheers to Luis Aragon, Ayse Moxam, and Eric VanderMaas who each received Passive House Institute – US (PHIUS) Verifier certifications, Marion Ligneau who received her Passive House Institute (PHI) certification, and Yao Wang and David Lane who both received their North American Board of Certified Energy Practitioners (NABCEP) certifications in solar PV. And, we welcomed a few new additions to the Bright Power family this year! Jon Braman and his family welcomed baby boy Avi. Bret Heilig and his family welcomed baby boy Faraday. Karl Haviland and his wife welcomed baby girl Kennedy. Punit Shah and his wife welcomed baby girl Navya.